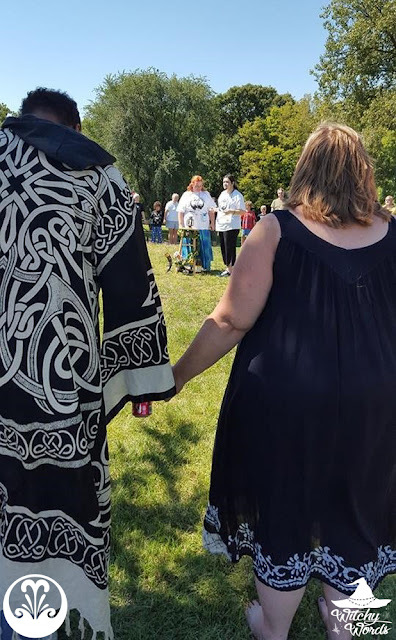 Before I begin, I would like to thank the KC Pagan Pride Day coordinator Sam Shryock and Pagan Pride Day for inviting us to perform the main ritual as well as my fellow circlemates of Circle of Fountains for working so diligently to create an amazing event. A gigantic thank you to Kat at Crescent Springs and Vickie and her family for donating ritual materials. A thank you goes to my husband Aaron, my fellow circlemate Kolika, good friend A.E. Goddard and Sam for taking photos and video of this event. And, last but not least, thank you to all the participants who came out and joined us in ritual. If it weren't for all of these wonderful people, this would not have been possible. From the bottom of our hearts, thank you, thank you, thank you. 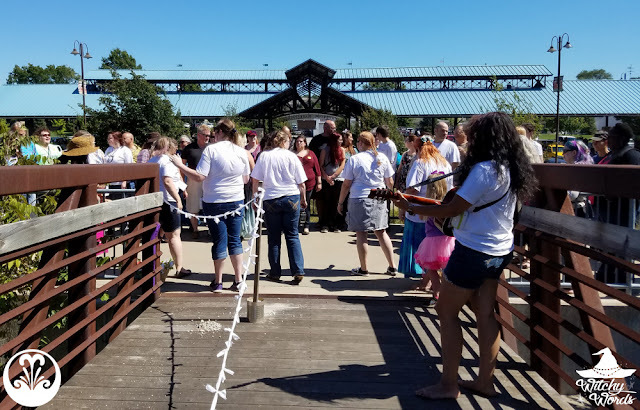 On Sunday, September 11th at the Merriam Marketplace and Werner Park, Circle of Fountains was honored to perform the main ritual for Kansas City's Pagan Pride Day! Nearly 100 people joined us for a fantastic event that my circle has spent this entire year creating. I'm so proud of everyone involved. If you would like to read about how we planned this event, click here. Circle of Fountains began by making ourselves easily identifiable. This included t-shirts with our logo on them as well as volunteer badges provided that KCPPD. 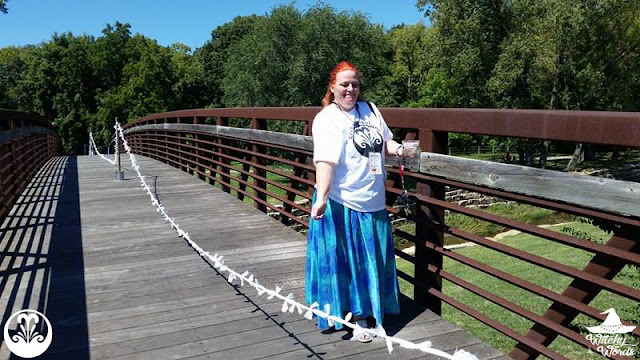 We then sectioned off a part of the bridge leading to Werner Park using poles provided by Vickie and her brother as well as knotted white ribbon. The only way in and out of Werner Park is via the bridge, so we wouldn't cut it off entirely. However, by providing this barrier down the middle, we created a sacred space through which ritual could occur. Once the sacred area was separated, we utilized a sage and lavender bundle to smoke cleanse both ourselves and the area of the bridge. We also offered ground egg shells and coffee beans to both our altar areas and the bridge to empower the space. We then as a circle charged a ribbon and tied it to the beginning of the bridge. This would come in handy later as a starting point to the meat of our ritual. 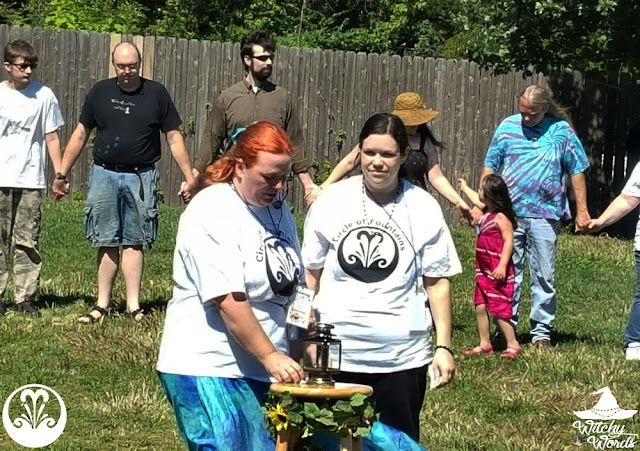 Finally, we did one more walk-through of the ritual as a group to ensure we were ready. After making a quick announcement over the PA system at the marketplace, we began our first official public ritual! To start things off, I spoke briefly about the community as a whole and how much it meant for us as a circle to give back by performing this ritual. Introducing each member of our circle, I noted that we included a wide variety of beliefs. One of the pinnacle points of Circle of Fountains is lauding differences in practices. Because there is no one book or belief that defines paganism and witchcraft, it can feel like each individual has to walk their path alone. In reality, these differences are integral to community and togetherness. 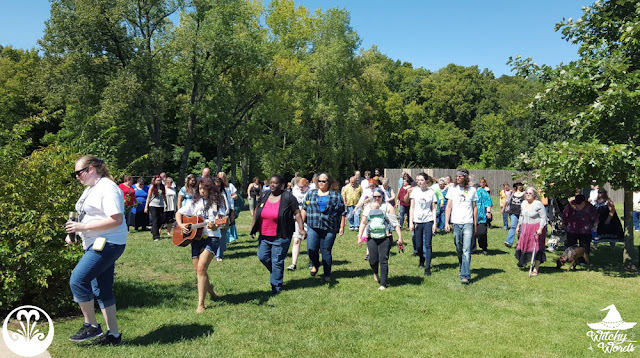 Our ritual would be about bridging the gap between those beliefs to form a strong, welcoming community. Instead of forming a circle and calling quarters, we would be utilizing the bridge as a sacred space. I cautioned that we would have a large group involved, so be mindful of everyone's feet. If anyone needed help crossing the bridge or could not do so, simply talk to one of our circle members and we'd be happy to help. Finally, this ritual was being performed under a number of retrogrades including Mercury. After defining Mercury Retrograde, I explained that things would inevitably go awry. That being said, we were there to have fun and we hoped everyone else would as well. I then turned it over to my circle! Phaedra asked everyone to hold hands. As each attendant held hands, they were asked to feel the magic flowing through them to create a ring of pure and endless light. Abby then spoke about how bridging the gap is about acceptance and love. Hatred comes from a lack of empathy and understanding, from ignorance and the unknown. On this day, those gathering as many individual faiths were unifying as one. Phaedra then opened the lantern on the altar. The candle within represented each individual soul: Each truth, each path, each light we follow. The lantern represented the vessels in which these souls travel: Our physical bodies. As Phaedra lit the candle, the flame symbolized the energy raised through the circle currently. She requested that the light led everyone here to unity. Kira then stepped forward. She spoke about how our community stands on many edges: The edge of summer into fall, the edge of the marketplace and the park, the edge of this moment where we created a safe space in a place that is maybe not always safe for us. It would be easy to assuming that, because everyone travels different paths, we must then travel these paths alone. However, Kira stated, as Dr. King said, “Darkness cannot drive out darkness; only light can do that. Hate cannot drive out hate; only love can do that.” So through this ritual, we strove to drive out the darkness with the light of the lantern and drive out the hate with love by “bridging” the gap between beliefs. Then Kolika stepped forward and asked us to look at our neighbors. No two people are exactly alike. No two belief systems are exactly alike. 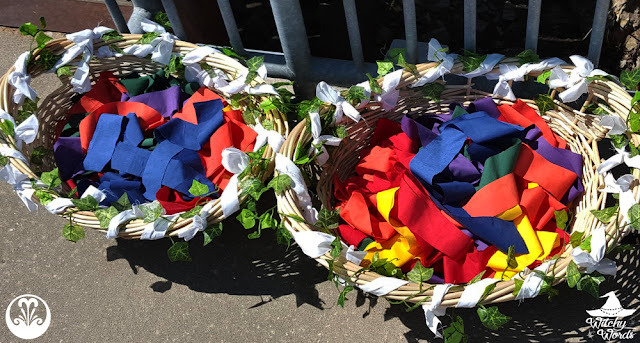 She explained that everyone would each get a ribbon from either myself or Phaedra and requested at each person infuse this ribbon with their individuality - their path, their beliefs, their life, everything that makes someone who they are. Kira then asked everyone to follow her! Amy took the lantern and she took a drinking horn of apple juice (as alcoholic drinks are not allowed within the park and thus we could not fill it with mead). Once on the bridge, she performed a blot. A heathen blot is an offering to a deity (or deities) for a certain purpose. In this case, Kira offered the apple juice within the drinking horn to open up the sacred space. Amy then cut the ribbon. Once she did, she explained how to obtain your ribbon and what would happen within the sacred space. She then invited everyone to join her and Kolika in song. 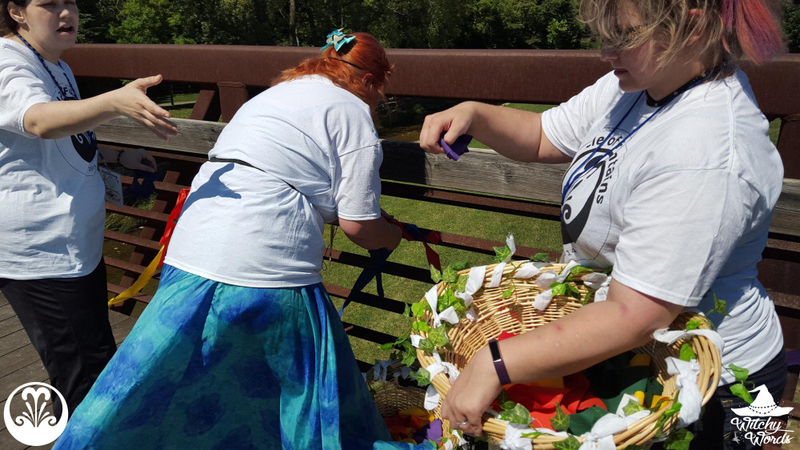 Phaedra and I used these baskets beautifully decorated by Amy to hand out the ribbons. She and I stood at either side of the bridge and helped everyone bless and charge their ribbons. 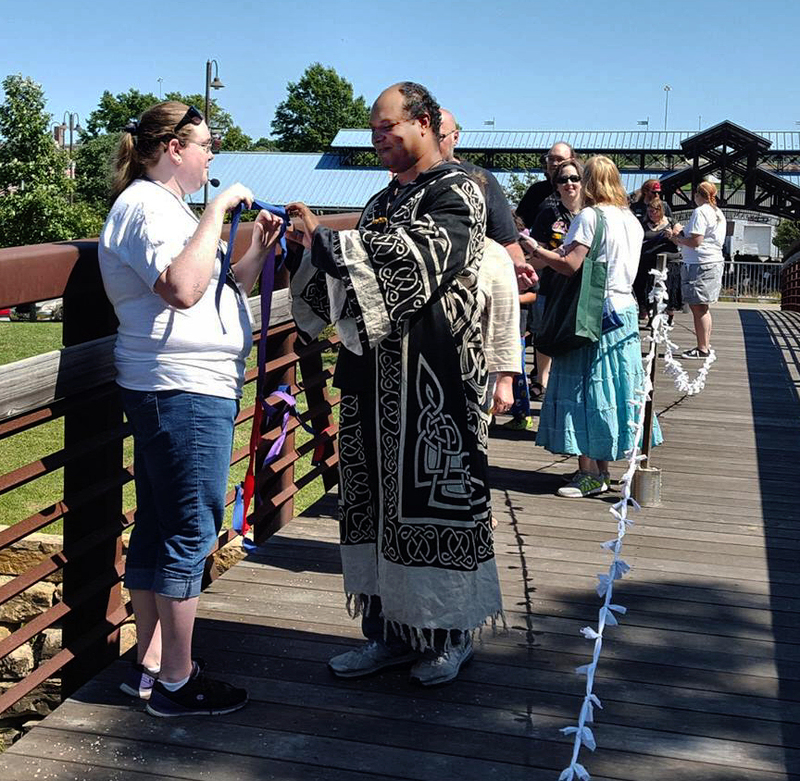 Each person then formed a line to enter the sacred space where they would tie their ribbon onto the previous ribbon, assisted by Kira. ... To form a circle om the other side, where Amy and Kolika stood singing. Abby stayed behind the group to help any stragglers who maybe couldn't quite hear us or who might not be sure what was going on. Once the last person entered the sacred space, Abby, Amy and I followed behind to help tie the ribbon up on the bars. 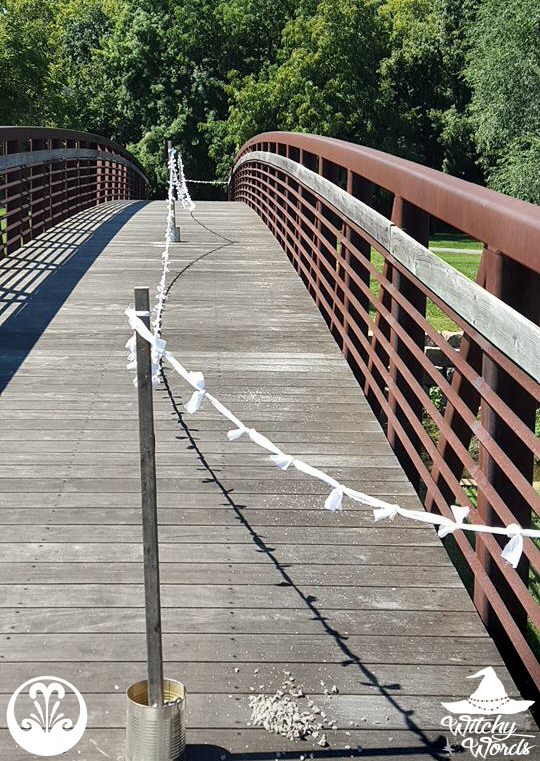 In the end, the ribbon formed a gorgeous symbol of unity across the entire bridge! 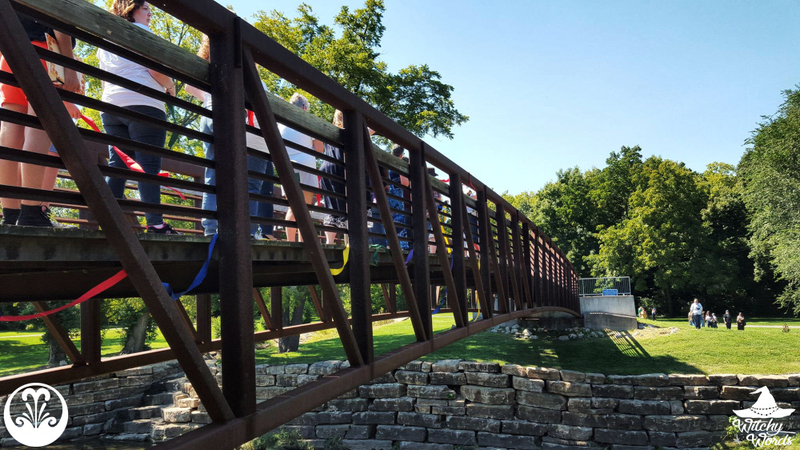 In fact, I actually assumed the entire ribbon wouldn't span the entire bridge given how big it was, but we actually went over by just a few! Once on the other side and upon the completion of the song, Laura asked us once again to join hands. She spoke about how we are each rooted by those who have helped us become who we are and who we want to be. Moving forward, she requested that we support one another, be kinder than necessary and be the light each person hops to see - the light that guided everyone across the bridge. Though we left the sacred space, we left changed. We released the spark of the flame so that the world may know the warmth and light of many individuals as one. I then concluded the ritual by requesting that, as each person walk back across the bridge, they take a look at the ribbon and remember what it represents. I also let everyone know that we would have a Q&A session at the Pagan Experience tent in the parking lot (pictured above)! 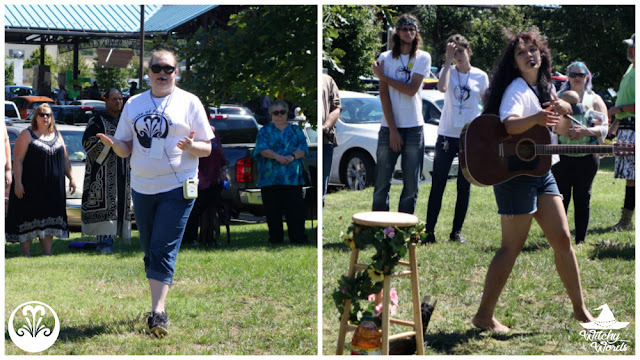 Our amazing group worked so hard to create such a special ritual for KC's Pagan Pride Day! I truly hope everyone enjoyed it. I leave you with a video taken by A.E. Goddard of the ribbon on the bridge. What a beautiful ritual! I wish I could have attended. Amazing work, all of you! Thank you so much, Dani. My circlemates did such a wonderful job on this. I have to give them an immense amount of credit; this was truly their ritual. I am happy my friend Tamilia was able to attend! I see her in the photos! We're so grateful as well! We positively love her! I was so happy to be there, Alice! 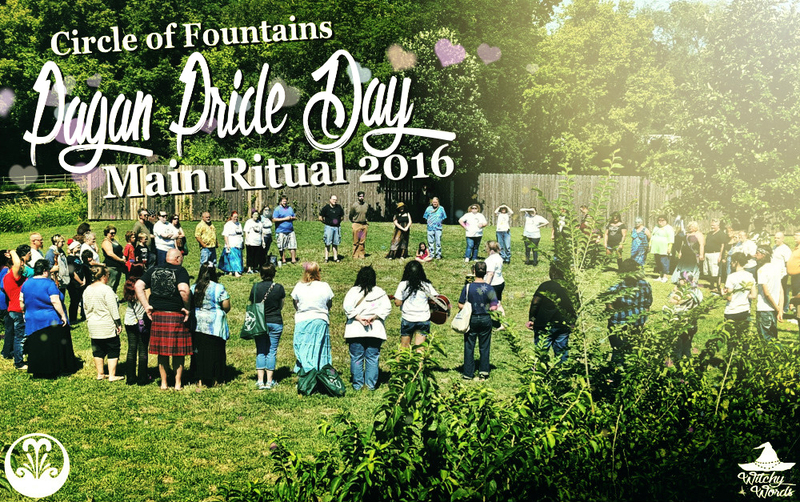 Thanks for offering a rejuvenating and community-affirming ritual, Circle of Fountains!! Of course! And welcome to the chaos - I mean circle! Everything looks beautiful! If I was doing a ritual, I'd use juice anyway since I can't drink. Thanks for sharing as usual! 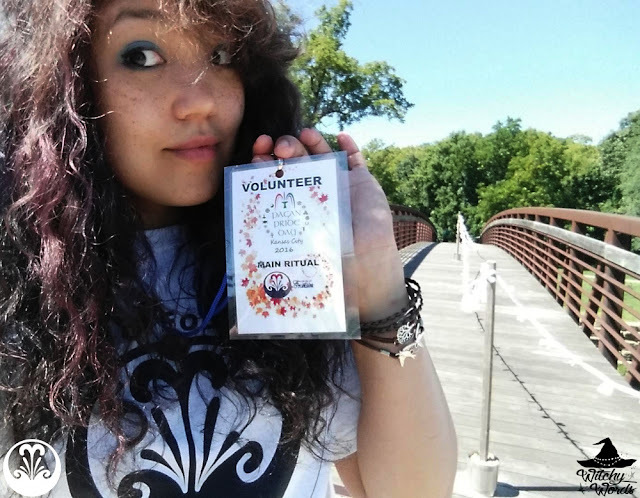 I am actually in the look out for a Pagan Pride in our area, but looking on how you guys work together to make this a success makes me want to organize one. I can definitely get some ideas from what you did here. It was a lot of fun. Of course, we were just the main ritual performers. There's a whole non-profit organization behind pagan pride day that makes this all possible. 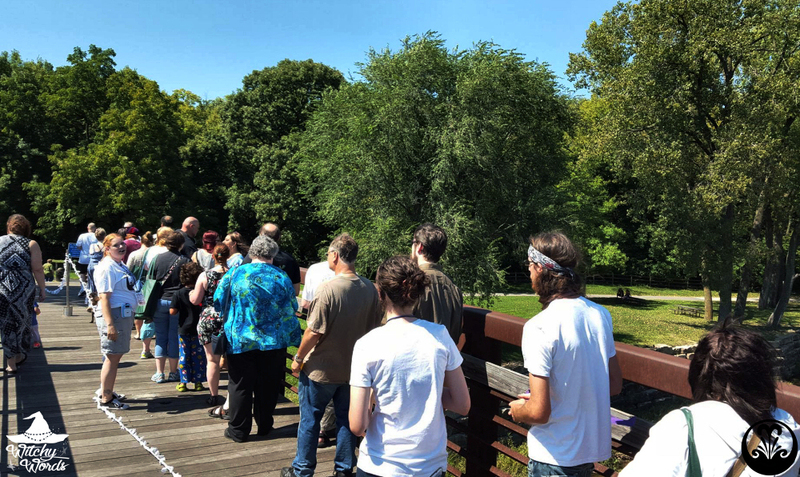 I'm so glad the ritual went well, and that you had gorgeous weather for it and a huge turnout. :) After reading the planning posts it was wonderful to see what you'd all created.